Boy do I have a lot to cover today!! First up, my Seeing Stars quilt. 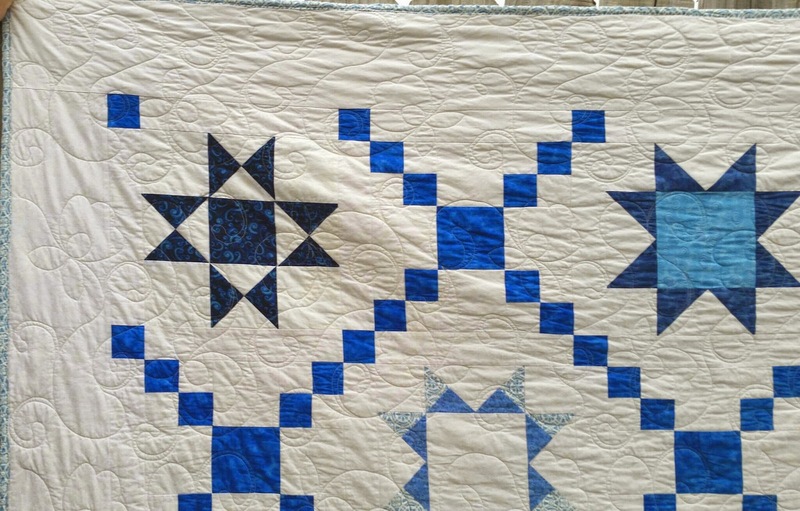 Val, over at Val's Quilting Studio, has an awesome Tuesday linkup where you can revive your old posts or old quilts you never got around to posting about. This week is irish chain quilts. This is an old quilt along that was hosted by Crazy Mom Quilts. I love blue and white together so I had to make it in blue and white. Unfortunately, my mom likes them too and as soon as she saw what I was working on, she claimed it as hers. 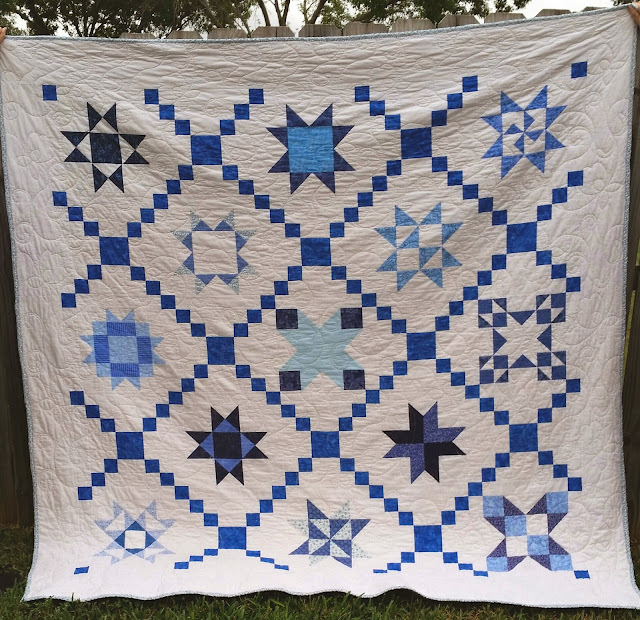 This was an awesome sampler quilt with irish chain blocks for setting. I used a bunch of blues out of my fat quarter stash with some blue yardage for the irish chain blocks to unify the quilt. It is backed in minky and is so soft and cuddly. Crazy Mom Quilts still has the pattern posted in her quilt along area and it is under the heading of Star Quilt Along. Next up, my own little star! :) Cassidy got her second acceptance letter from college yesterday! 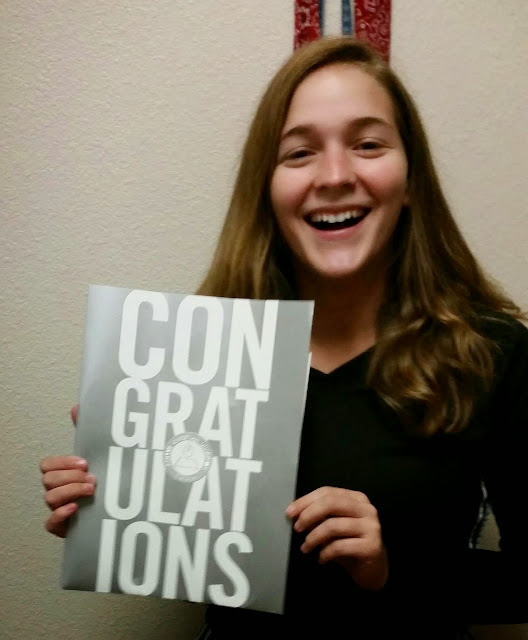 This one from Abilene Christian University and it included a scholarship! Silly girl was worried that she wouldn't be accepted anywhere and the first two places she applies to, she get in. And lastly, Lori Holt from Bee In My Bonnet is hosting an instagram quilt along!!! 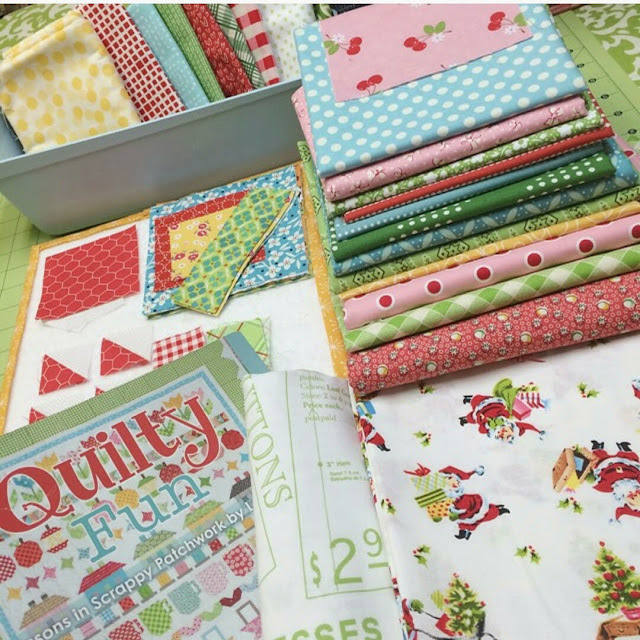 You need to use her book, Quilty Fun: Lessons in Scrappy Patchwork , but she's also adding blocks to it and is making it a Christmas quilt. I didn't see anything about it on her blog, so you will need to follow her on instagram at @beelori1 and use #haveyourselfaquiltylittlechristmas. I know, I have enough projects to work on, but....I finally got my Quilty Fun book last month and have been dying to dive into it! This will be perfect! She's already done the first block, one of the house blocks from the book. I can't wait to dive into my stash tonight and make one up! Won't you join in?? My instagram link is in the sidebar. We can watch each other's progress! Come play!! Okay, I think that's it for this morning! Y'all have a fun, productive quilty Tuesday!! 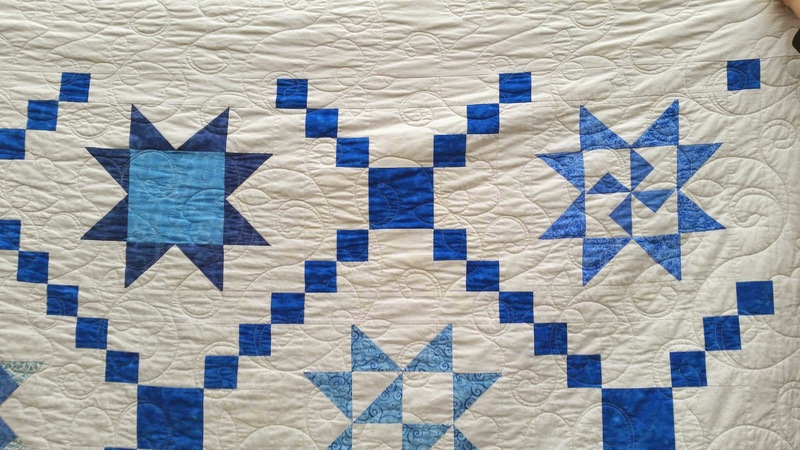 Linking up with Val over at Val's Quilting Studio for Tuesday Archives. Tell your daughter congratulations! She is about to start new adventures and an exciting time of life. I love your Irish Chain quilt! I have not posted to Val's linky yet today but am working on it. Your Lori Holt project looks delicious - pattern, fabric, and all. As the mom of one graduate and another freshman...those letters are amazing! Congratulations! Your Irish Chain is beautiful! Congratulations to your daughter. It's both a scary and exciting time for her. Hope she gets to attend her top pick. 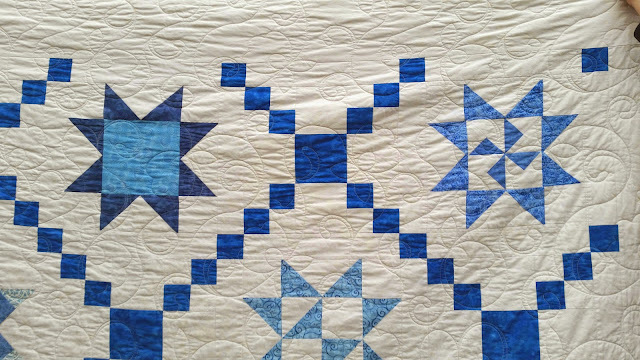 Love the blue and white stars. It's really hard not to like that color combo and your version is beautiful. Love your star sampler. I really like it when different blocks come together into a cohesive design which you did perfectly blending the blues! Live the simplicity of the blue and white. I feel so old when I read your post as I so remember these wonderful times with our girls....who are only 15 months apart! Glad you two are close.